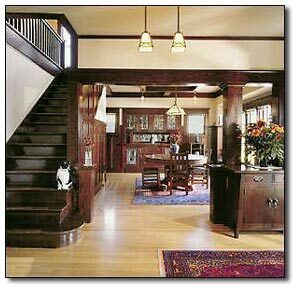 The Arts and Crafts movement, its style and its influences, from William Morris to Gustav Stickley and William de Morgan. In 1861 the english designer William Morris started the arts and crafts movement in an effort to improve the tastes of the victorian public. The arts and crafts movement was the parent of art nouveau, but it persisted into the new period and after 1900 merged into the mainstream of the newer style. Another development that influenced art nouveau was the aesthetic movement, an english decorative arts style created by followers of william morris during the 1880s.</p. The aesthetic movement took its sources from medieval art, as did its arts and crafts counterpart, but it adapted the newly discovered arts of Japan as well. It survived for only a decade, and much of the style was absorbed into Art Nouveau. Some of the William Morris inspired fabrics and wallpapers of Walter Crane, Charles Voysey, and Arthur Macmurdo (1851-1942), designed in 1882, could easily be mistaken for Art Nouveau circa 1895. And lectures on the decorative arts of William Morris were available at the Boston Athenaeum and other American libraries as soon as they were published in London. In 1873 William Morris & Company began to sell their wallpapers in Boston and by the mid-1870s had representatives for their growing line of wallpaper, fabric and carpet, in many major American cities. Especially with the development of the Queen Anne Revival, and with emerging styles that were based on the “old-fashioned homes” of the American Colonial period: the Shingle Style and the Old Colony Style. Arts & Crafts Movement ideas were given an even wider audience during the 1882 American tour of Oscar Wilde. He championed Morris, the Pre-Raphaelites and the design and art-manufacturing philosophy in lectures presented in over 120 North American towns and cities. By the mid-1880’s, English designs and locally made Arts & Crafts products were specified by trendsetting American architects and selected by affluent homeowners for the most stylish and fashionable American townhouses, suburban cottages and country villas. It was the children who grew up in these artistic homes of the 1880s who became patrons of Gustav Stickley, who subscribed to the Craftsman Magazine, and who built bungalows for their first homes. What to look for when designing your authentic arts & crafts interior. Colour schemes – Use natural creams, terracotta, mustard yellow, olive green, deep blue and a deep crimson. Walls – Wood panelling to be truly authentic and it should be painted a muted green or greeny-blue. Sherwin-Williams have a range of historic palettes, including an arts & crafts range that shows good combinations of colours. Wallpaper – was the key decoration. Original patterns used vegetable dyes and wood blocks. 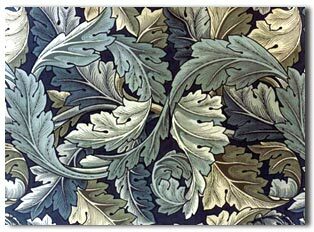 However, hundreds of original William Morris designs are still manufactured by the major companies like Sanderson. Patterns should be on a large-scale with repeats. Sanderson bought the original printing blocks from Morris’s firm when it closed down. Floors – Should be natural wood in either parquet or boards in oak and give a rustic feel. They should be polished or stained to a dark gloss finish that reflects the light. Furniture – Handmade natural wood furniture. Oak is the wood to look for. Decoration should feature cut-outs of upside down hearts; pieces with copper inlays and leather straps. Chairs should have rush or leather seats. Fireplaces – An original arts and crafts fireplace should dominate a room with huge wide hearths set in an inglenook or recess. The mantelpiece should be carved oak, often with a motto above it. Tiling – should be art nouveau in style with brighter colours – cobalt blue, turquoise, greens and reds. Typical motifs include galleons and stylised flowers. Originals are available in salvage yards. Reproductions are available from large outlets. Oriental Influences should feature and add a sense of the Orient by adding blue and white china, palm leaf fans, screens and oriental rugs. Stained glass – was a very popular addition and enhanced the medieval feel. There are still stained glass designers around or the modern equivalent is available as an option from double glazing companies. Curtains – Should be supported by plain wooden or brass curtain poles. Curtains shouldn’t have any frills or flounces. Lighting – Well made plain wall sconces with good lines and well formed glass shades. Nothing dangling or overly ornate. Flowers – Enhance the decoration using simple flower arrangements or use green house plants such as potted palms or cheese plants. A chronological history of the arts and crafts movement. 1819 – Birth of John Ruskin. 1834 – Birth of William Morris. 1848 – Pre-Raphaelite Brotherhood formed and first Pre-Raphaelite works exhibited. 1849 – Paris: 11th Trade Exhibition. Visited by Henry Cole, and Matthew Digby Wyatt, who had been asked to prepare a report on the Exhibition for the Society of Arts. It was this exhibition which was the inspiration for the Great Exhibition organized by Henry Cole and Prince Albert. 1851– London: the ‘Great Exhibition’ (the Great Exhibition of the Works of Industry of All Nations), held under the direction of the Prince Consort and Sir Henry Cole. Allegedly visited by Morris, then aged 17, who was nauseated by the tasteless and materialistic display. 1853 – Great Industrial Exhibition, Dublin. 1855 – Paris: L’Exposition Universelles des Produits de l’Industrie de toutes les Nations, included the works of the Pre-Raphaelites which had a considerable influence on the French Realist School. 1856 – Owen Jones’ ‘The Grammar of Ornament’ published, the first book to have full colour plates coloured by chromolithography. 1857 – American Institute of Architects founded in New York. October: An exhibition of British painting opened in New York, going on to Washington, Philadelphia and Boston, including Pre-Raphaelite works assembled by Ernest Gambart. 1859 – Planning and building of Morris’ Red House by Philip Webb at Upton in Kent. 1861 – Morris, Marshall, Faulkner & Co. founded to provide the type of furniture so conspicuously lacking in the mid nineteenth century – solidly constructed and without superfluous ornament. Madox Brown, Rossetti and Burne-Jones all worked for the firm, as did Arthur Hughes, another Pre-Raphaelite, albeit briefly. The foreman glass worker was George Campfield, a recruit from the Working Men’s College. 1862 – London: International Exhibition. Included a stand furnished by Morris & Co. which was praised for archaeological exactness of their imitation of the style of the Middle Ages, and the first Japanese art and crafts works to be widely seen, which had an immediate and widespread effect on the design of the period. 1866 – Morris & Co. undertook two important commissions; the decoration of the Green Dining Room at the South Kensington Museum and of the Armoury and Tapestry Room at St. James’s Palace. 1871 – 1st South Kensington Exhibition. 1872 – 2nd South Kensington Exhibition. 1873 – ‘Martin Brothers‘ pottery established by the brothers Robert, Wallace, Edwin and Charles Martin in Fulham. 1874 – Morris began his experiments with fabric design. 1875 – Formation of ‘Liberty & Co.’, a shop specializing in Oriental art and artifacts. Patrons of the new shop included E.W. Godwin, D.G. Rossetti, Burne-Jones and Whistler. Christopher Dresser, after his visit to Japan, attempted to open a business selling Oriental goods (Dresser and Holme set up in 1878 in Farringdon Road) and in 1880 was appointed Art Manager of the Art Furnishers’ Alliance. Both businesses failed. Dresser’s son Louis, however, later worked for Liberty & Co.
1876 – Philadelphia: Centennial Exposition. The displays of both Oriental pottery and E. Chaplet’s ‘Limoges’ glazes influenced studio potters in America, especially Hugh C. Robertson and M. Louise McLaughlin. Christopher Dresser lectured in Philadelphia and his influence can clearly be seen in the change of style of Daniel Pabst’s work, which had been exhibited that year. Dresser was commissioned to make a collection of Japanese artifacts, including glass, for Tiffany & Co. while he was in Japan in 1877. 1877 – M. Louise McLaughlin developed ‘Limoges’ underglaze painting. 1878 – Herter Brothers of New York designed the interior of the Mark Hopkins House in San Francisco, to which the California School of Design moved in 1893. 1879 – C.H. Brannam Ltd. Established in Barnstable, Devon by Charles Brannam for the production of art pottery, known as ‘Barum Ware’, which was featured in later Liberty & Co. catalogues. Wheeler and the Society of Decorative Art. 1880 – Rookwood pottery founded in Cincinnati. 1881 – Fourth American edition of Eastlake’s ‘Hints on Household Taste’ published. It was first serialised in ‘Queen’, 1865-6 and proved incredibly successful in America, giving rise to the ‘Eastlake Style’. Aller Vale Pottery re-organised for the production of art pottery after a fire had destroyed the old factory. 1882 – Partnership of Henry Tooth and William Ault established the Bretby Art Pottery. 1882/3 – L.C. Tiffany & Co., Associated Artists, decorated the White House. 1883 – Mackmurdo’s book on ‘Wren’s City Churches’ published with the famous title page, now seen as a seminal influence on Art Nouveau. The American Exhibition of the Products, Arts and Manufactures of Foreign Nations in Boston, U.S.A.
1884 – First appearance of ‘The Hobby Horse’, a quarterly magazine of the Century Guild. 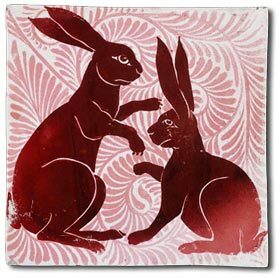 Printed on hand made paper with the advice and assistance of Emery Walker it is a precursor of Morris’ experiments with fine printing at the Kelmscott Press. 1885 – Home Arts and Industries Association established by Mrs. Jebb with the support of A.H. Mackmurdo. 1886 – Liverpool Exhibition. Mackmurdo’s stand provided yet more inspiration for the Art Nouveau artists of the ‘fin de siecle’. The elongated roof supports ending in wide flat ornamental finials are the prototypes of many later architectural decorative features. 1886/7 – Charles Robert Ashbee went to live at Toynbee Hall, the pioneer University Settlement in the East End of London. He lectured at places such as Deptford or Beckton, ‘of Gas Works fame’ to recruit men for Toynbee Hall. There he started a Ruskin reading class which he expended into a class of drawing and decoration. He supervised the decoration of the Toynbee Hall dining room by members of his own class, and it was from these pupils that the nucleus of his Guild of Handicraft was drawn. 1888 – Guild of Handicraft founded with three members and a working capital of fifty pounds. Despite Morris’ doubts, he met Ashbee’s plans with a great deal of cold water, the Guild was remarkable successful for many years, only running into financial difficulty in 1907. National Association for the Advancement of Art in Relation to Industry formed. At both the first Congress in Liverpool, and at Edinburgh the following year, Morris and Crane spoke on socialist issues and were said to have spoiled the Congress. 1889 – Paris: Exposition Universelle Internationale. 1890 – Establishment of the Kelmscott Press, the venture that was to dominate Morris’ last years. 1891 – Kenton & Co. exhibition at Barnard’s Inn, the premises of the Art Workers Guild. The Company failed in 1892. 1892 – Walter Crane lectured at the Art Institute of Chicago. 1893 – Chicago: World’s Columbian Exposition; World’s Fair. Included exhibits by Tiffany & Co.
1894 – Della Robbia pottery established by Harold Rathbone in Birkenhead. The First mission style furniture was made in San Francisco; the first item was a chair for the Swedenborgian Church in San Francisco, followed by a rocker and probably other furniture made by Forbes Co.
1896 – Death of William Morris in October. Foundation of the Central School of Arts and Crafts with W.R. Lethaby and George Frampton as joint principals. Charles Rennie Mackintosh Art Nouveau Artist won the competition to provide the design for the new Glasgow School of Art. The Song of Songs completed at Roycroft by Elbert Hubbard. 1897 – Pilkington’s, the glass manufacturers, established their pottery, manufacturing tiles and other wares designed by Walter Crane, Lewis F. Day and C.F.A. Voysey. First major Arts and Crafts exhibition held at Copley Hall, Boston in April. On June 28th the Boston Arts and Crafts Society was founded. Charles Rennie Mackintosh undertakes the designing, decoration and furnishing of a number of tea-rooms in Glasgow for the Misses Cranston. The tea-room movement had begun in the 1870s to combat day time drunkenness by providing billiard rooms, smoking rooms etc. Mackintosh collaborated on the Buchanan Street and Argyll Street rooms with George Walton but had complete control over the Ingram Street (1901) and Willow (1903-4) tea-rooms. The work was not completed until 1916. The first article on Frank Lloyd Wright appeared in ‘House Beautiful’. A second followed in 1899. 1898 – The artists colony at Darmstadt set up by the Grand Duke of Hesse. Furniture designs commissioned from M.H. Baillie Scott and C.R. Ashbee and made by the Guild of Handicraft. 1989/9 – Libertys Cymric silver range established. Many arts and crafts artists employed as designers, among them Arthur Gaskin, Bernard Cuzner and Reginald (Rex) Silver, but the most prolific and consistently used was the Manxman, Archibald Knox. 1899 – Adelaide Alsop Robinea, an associate of the University City Pottery, Missouri, began publication of ‘Keramic Studio’ in Syracuse, to provide good designs for other potters. 1900 – Paris: L’Exposition Universelle. This exhibition provided an unrivalled showcase for the work of Art Nouveau designers. The work of the obscure Bromsgrove Guild, founded in the early 1890’s by Walter Gilbert, cousin of the sculptor Alfred Gilbert, was by some organisational oversight, practically the only English craftwork to be seen. John Ruskin and Oscar Wilde die, one mad, the other disgraced. C.R. Ashbee on a lecture tour of America; he met Frank Lloyd Wright at Hull House, Chicago. 1901 – Ernest Gimson established his furniture workshops in Cirencester, where he was joined by Peter Waals. Rose Valley Association incorporated at Moylan, Pennsylvania by W.L. Price and M. Hawley McLanahan based on the ideals of Morris’ ‘News from Nowhere’ which had been published in England in ‘The Commonwealth’, 1890. ‘The Craftsman’, first published by Gustav Stickley at Syracuse in October. 1902 – Handicraft, first published in Boston. Joseph Twyman. Marshall Field & Co. of Chicago stocked Morris & Co. goods. 1903 – William Morris Society founded in Chicago, 7th May, by Joseph Twyman. Artificers Guild acquired by Montague Fordham, one time director of the Birmingham Guild of Handicraft. 1904 – Alexander Fisher set up a school of enamelling in his Kensington Studio. 1905 – Tiffany pottery first sold to the public. 1906 – C.L. Eastlake died. 1907 – Founding of the Deutsche Werkbund by Hermann Muthesius who had been sent in 1896 by the Prussian Board of Trade to England to make a study of English architecture and decoration. 1908 – Ashbee visited America to lecture. After his visit he contributed articles to ‘House Beautiful’. 1909 – Guild of Handicraft disbanded. 1910 – Fulper Pottery Co., New Jersey began production of art pottery. 1911 – Turin: International exhibition. University City pottery won the Grand Prize of Europe for Mrs. Robineau’s ‘scarab’ vase. 1912 – Archibald Knox visited Philadelphia and New York. 1913 – Omega Workshops opened in Fitzroy Square by Roger Fry with work by Duncan Grant, Vanessa bell, Wyndham Lewis, Frederick Etchells and Cuthbert Hamilton. They specialized in interior decoration with murals, painted furniture, pottery and rugs. The venture, influenced by Poiret’s Paris workshops survived until 1919. 1914 – Deutsche Werkbund exhibition in Cologne. 1915 – Gustav Stickley enterprises declared bankrupt. 1916 – Last issue of ‘Philopolis’, September. 1919 – The Bauhaus founded in April in Weimar by Walter Gropius, who had studied architecture under Peter Behrens.